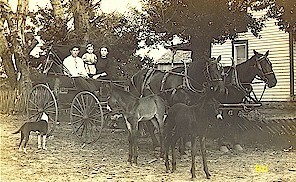 One of the famous mule breeders in Missouri was W. H. Helsley. He was born about 1856 in Mowreystown, Highland County, Ohio. He had little access to a good education. He started gaining knowledge and experience with Jacks at the age of fourteen and came into the business when he was 21. At the age of sixteen, he had moved to Missouri, riding a horse all the way from Ohio. He eventually owned a large farm at Ionia in Benton County, Missouri, north of the town of Lincoln.. He became very adept at breeding jackstock and mules. He once told of going to the horse and mule market in St. Louis in early 1924. There he saw 8,000 mules on the market that day and many of them brought more than $200 per head. David Helsley, grandson of W. H. Helsley, made some corrections to the Helsley information above from the 1924 reference. David wrote: This is the only picture I have of W. H. Helsley. It was taken at his place in Lincoln, MO. The two girls are my dad's half sisters. Photo was taken about 1916. The house in the background was used as haunted house by the JCs in Lincoln, until it burned down in the 90s. The barn is still there. Also my father was Frank Guy Helsley, born in Ionia in 1903. Thomas Greer Snorgrass, of Tipton, was one of the most highly respected mule breeders in Missouri, was born into a family of thirteen children in 1842. The Morgan County farm they lived on was known as Snorgrass Farm. Snorgrass bought most of his best jacks in Kentucky. One of these was Gold Standard, a black jack. It was thought that the best jack he ever had was one named Kentucky Rattler. He also bought and sold many mules. The Snorgrass farm also raised purebred Shorthorn cattle, Poland China hogs, and prize-winning Buff Plymouth Rock chickens. At the time of his death in 1912, Snorgrass had many other accomplishments such as being a judge of the circuit court of Morgan County and the Mayor of his town, Syracuse. Luke McClure Emerson was born on a farm in Pike County, Missouri about 1860. He only lived to the age of 52, but his life was marked by adventurous events and an amazing outlook on life and business. He was known mainly as an importer and dealer in jackstock more than he was known as a breeder. His nephew once wrote that at the 1906 Monsees sale, Emerson bid on every jack auctioned and purchased nine that day. His nephew also noted that Emerson always paid in cash and sometimes carried a big roll of money  sometimes up to $80,000. 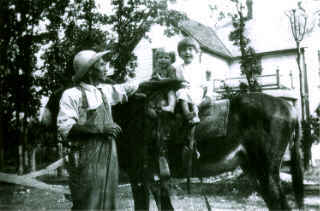 It was claimed that Luke Emerson imported and handled more jacks and jennets than all other Missouri dealers put together. His first importation had included forty head from Spain. He made ten importations in all. Most were Catalonians. But there were also a few Andalusians and even some from France. Some importations were not without problems. One group of jacks were to be shipped from Liverpool, England on a steamer. The night before they were to be shipped, they got loose in the streets of Liverpool and had to be rounded up by police. When they arrived in New York, they escaped again and were scattered over a ten mile area. Some suspected that the jacks were turned loose in New York for publicity purposes. Unfortunately, the jacks arrived during the financial panic of 1894. Some were sold on notes that were never collected and some never sold. So by 1896, many of the jacks along with 75 mules were exported to Capetown, South Africa. Emerson was quite a trader. It was told that he traded jacks for such things as a black bear, a parrot, piano, automobile, mounted moose head and farms. He had jacks priced from $100 to $3,500 and he always exhibited at Worlds Fairs including those in Chicago and St. Louis. He also had grooms that had many skills. To reduce the fracture in the leg of an injured jack, a groom once used the leg of a leather boot, wooden splints and tied it up, like a cast but long before such a thing was heard of on animals. Later that same Jack was sold for $2,000 with a small bump as the only sign of an injury. Leonidas Duval was the first jack breeder of great potential (and was considered the leading man) in northwestern Missouri (Ray County) during his career. He spent most of his years on a farm about twelve miles from Richmond, MO where his initial interests were with Thoroughbred horses. After 1878, he became interested in jacks, he took a huge risk and brought jacks into the state. He went to Kentucky and bought a jack for $1,200. Mr. Duval did this at a time when little was known about these creatures and reasonable insurance was unheard of. But none the less, people traveled miles just to come see them. In the end he made twenty-three trips to Kentucky in hopes of suitable jackstock. Throughout his life, he successfully bred and sold various jacks, he was even successful with home-made remedies for his Jacks. His special technique was to smear a mixture of honey and old peach brandy on the suffering jacks tongue. Duval became so attached to his jacks that when he returned home from traveling that they smelled him long before his wife could hear his footsteps. They would greet him with their loud braying alerting his wife that he was near. Major W. M. Gentry was recognized for his part in improving many classes of stock breeding in Missouri. For many years, he served as the Treasurer of the American Breeders Association of Jacks and Jennets. The association made its greatest progress under Major Gentry. Major Gentry had purchased his Oak Dale Farm in Pettis County, three miles north of Sedalia in 1846 where he kept high quality jack stock. Major Gentry was not the only member of his family with well-known accomplishments. His family was recognized for its contributions to the growth of Pettis County and some say for the state as a whole. Gentry was also noted for a generous act that led to the development of one of Missouris finest jackstock farms. In 1886, Gentry allowed Louis Monsees to buy five of his best jennets on an indefinite credit basis. Monsees had used all of his money to purchase his jack, Superior Mammoth, in Kentucky. This jack when crossed on the Gentry jennets produced some of Mr. Monsees best stock. This page was designed by Piper Wilson.